In years past, farmers learned how to make recipes for mincemeat at butchering time. Usually this was a project for fall just in time to make the mincemeat for the holidays. Back then people tried to utilize every part of the animal after butchering, whether it was pork, beef or venison. Most parts of any of these animals can be used to make mincemeat. I have always used lean beef and suet* (see below) but Dad use to tell me about all the different parts of meat that are used. I learned how to make recipes for mincemeat and I am giving you two. These will show how various parts are used which most people today will discard even if they do butcher their meat. We always have used the hog’s head to make “piggy pudding” and scrapple. The beef tongue was generally pickled or sliced and sautéed. WHAT IS SUET? Suet is often used when making mincemeat or for barding very lean meat to give added flavor and moistness. It is also used to make tallow which is used to make shortening. Suet is the raw hard fat of the beef which is around the loin and kidneys of the animal. Suet is very different from the soft animal fat. It has a much lower melting point than the fat; 45 Celsius (113 F degrees) to 50 Celsius (122 F degrees) compared to 184 Celsius (363 F degrees). Cover tongue with boiling water and simmer until tender; cool. When meat is cold, chop it very fine; blend together with apples, raisins, citron and suet. Blend in sugar and spices; pack in a clean stone crock. Combine wine and whiskey; pour over mixture. Cover tightly and store in a cool place; will keep for a few months. WHAT IS CITRON? Citron is a citrus fruit. It is native to India and is cultivated in the Persian Gulf. I have found it very difficult to purchase here in the United States. If you cannot find citron, you can substitute with the flesh of citrus fruits; orange, lemon, lime and even grapefruit. Salt, cinnamon and allspice to taste. Combine and mix all ingredients; cook thirty minutes and can in sterilized jars. This is a traditional recipe for mincemeat. Roll out half of the pastry dough to an 11 inch circle; line a 9 inch pie pan and trim excess. Refrigerate lined pie pan and the other half of dough until ready to use. Combine remaining ingredients in a large bowl; spoon into the pastry lined pie pan. Roll out remaining dough into an 11 inch circle. Make several slits near the center for steam vents; adjust over the filling and trim excess. Crimp edges of dough together; bake 40 to 45 minutes or until crust is golden brown. Divide dough in 4 balls and roll 2 balls each into a 12 inch circle; line two 9 inch pie pan. Combine in mixing bowl the mincemeat, pie filling, marmalade, flour and walnuts. Divide the mixture evenly between the two pastry lined pie pans. Roll remaining 2 dough balls into 12 inch circles; cut into ½ inch wide strips. Weave the strips atop both pies to make lattice tops; flute edges. Bake at 400F degrees for 35 to 40 minutes. Combine mincemeat, pineapple and apples; blend and set aside. 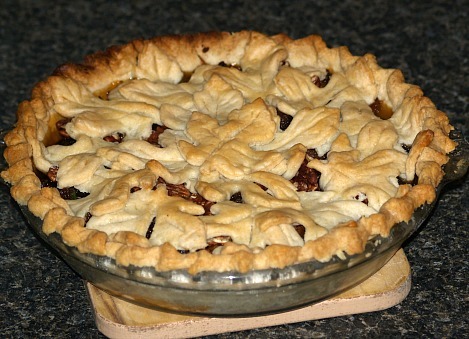 Roll out ½ of pie dough and line pie pan; spoon mincemeat mixture into pie pan. Roll out remaining dough and cut all the dough with a leaf shaped cookie cutter. Arrange all the leaves on top of the mincemeat filling; sprinkle top with sugar. Bake at 425F degrees for 30 to 35 or until golden brown. After about 12 minutes cover edges of crust with foil to prevent over browning.